When in Paris, don't be fooled by bearers of fake petitions. They'll shake you down for money, and they may pick your pocket. ABOVE: Petion scammers accost a tourist on the Pont St-Michel. In other articles, we've described the Paris "Gold Ring" Scam (which is almost comical, unless you fall for it) and the petty shakedown artists known as the "String Men" of Sacré-Coeur. Today's warning is about the "Petition Scam," which can be a double-whammy assault on your pocketbook. As you're walking along, a gang of youths (usually teen-age girls or young women) will approach you, asking you to sign a petition on a clipboard. Not wanting to appear rude, you take the proffered ballpoint pen or pencil and sign your name on the phony petition. After you've signed, the petition-bearer asks for money to benefit a charity or political cause. (In reality, the criminal gang will keep the money.) You can say "Non," but the petition-bearer and her friends will be extremely persistent, and you'll probably end up handing over some coins or a five-euro note just to make the annoying scammers go away. 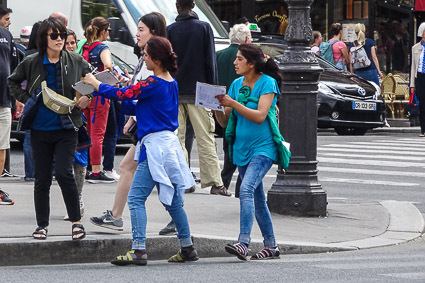 Often, the petition gangs include pickpockets. While you're signing a petition for Girl Un, Girl Deux may be extracting a wallet or phone from your pocket or purse.